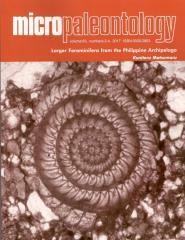 ABSTRACT: Nineteen successive larger foraminiferal assemblage zones of Late Cretaceous to Quaternary age are recognized in 265 stratigraphically positioned samples from 15 islands of the Philippine Archipelago, based on the biostratigraphic relationship of 192 age-diagnostic larger foraminifera species, including 19 new species and 8 new genera, together with 64 species of associated planktonic foraminifera. The following new taxa are described herein: Orientorbitoides, n. gen., Paleobaculogypsinoides, n. gen., Hashimotoina, n. gen., Eopellatispira, n. gen., Mindoroella, n. sp., Baculogypsinella, n. gen., Luzonella, n. gen., Quasibaculogypsinoides, n. gen., Orientorbitoides cebuensis, n. sp., Pseudorbitoides philippinensis, n. sp., Paleobaculogypsinoides catanduanensis, n. sp., Calcarina catanduanensis, n. sp., Asterocyclina pinugayensis, n. sp., Assilina philippinensis, n. sp., Hashimotoina mindanaoensis, n. sp., Alveolina luzonensis, n. sp., Glomalveolina reicheli, n. sp., Pseudolituonella mindanaoensis, n. sp., and Pfendericonus mindanaoensis, n. sp., Eopellatispira mindoroensis, n. sp., Mindoroella mindoroensis, n. sp., Baculogypsinella eocenica, n. sp., Luzonella trochidiformis, n. sp., Quasibaculogypsinoides primitiva, n. sp., Boninella negroensis, n. sp., Orbitogypsina mindoroensis, n. sp., and Borelis fusiformis, n. sp. These zones can be correlatedwith larger foraminiferal assemblages in Japan, India, and Turkey as the basis for an advanced Letter Stage system, for the foraminiferal record in latest Mesozoic and Cenozoic shallow-water environments of the Tethyan realm extending from the western Pacific to the Mediterranean. Atotal of 181 species of larger foraminifera from the Philippines are illustrated and described based on re-examined and new samples.